Among the various types of performance tests usually mentioned in the testing environment, there are some standard names that sound familiar with different concepts derived from the names of various tools. Meant to simulate the maximum use of the system, for which we must analyze the number of users that will have access and the operations that will be executed. The purpose is to find the stepping up breaking point by executing the most accessed transactions (typically) in an incremental manner as to the number of users, until the system fails. This will indicate the maximum number of users that the system can support, with the infrastructure in which it is installed, and how long it takes to recover regular functioning after the system has been down for a period. Meant to test the system during longer periods of time, in order to reveal other types of problems. These may come up following the accumulation of problems, as in the case of a memory leak and to analyze the system’s behavior following a specific period in operation. A simulation of the load, with limited speed of connection of virtual users (all of them or just a group) to analyze the response time obtained by those users connected through lower speed networks (3G, distant areas, through the Internet, etc.) Speed simulators or traffic shapers are used in these tests, in addition to some tools that have this functionality included. To analyze the system’s behavior when exposed to intensity peaks mixed with regular load, showing the recovery following the increased load. This sort of situations happen in reality, so it is interesting to analyze the system’s behavior in such cases. Analyses how system escalates. It indicates, for example, how many more users we can support if another application server is added, or improvements in timing when we add more CPU to the database server. These kinds of performance tests should be executed during the development cycle or before launch, in order to be able to detect problems before the end user faces them. 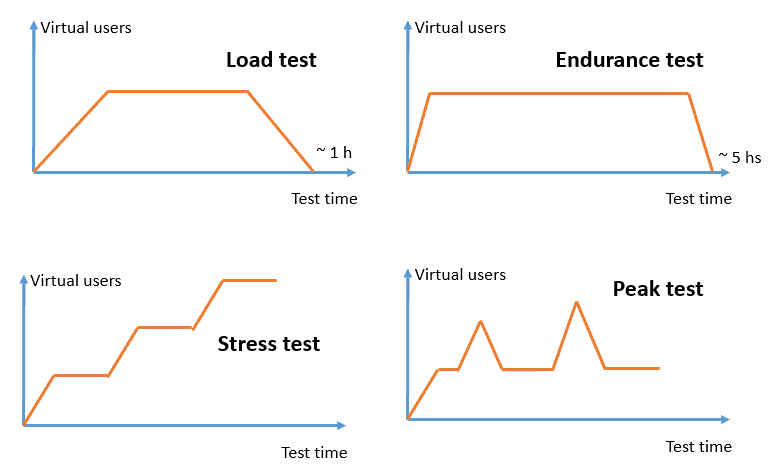 The figure below shows a way of representing some of these performance tests, and what the graph of active virtual users would be like throughout the testing time. 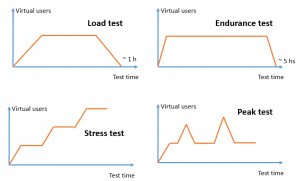 Are you unsure of which type of performance tests you need? Contact us and let’s get started. [Infographic] Why Should I Become a Performance Tester? Our performance and load testing specialist, Leticia, shares with you the checklist that she developed for building scripts that are easy to read, understand, use, and modify even for those unfamiliar with JMeter. Don’t get started with test automation without reading this eBook! When is the best time to start performance testing? What does the Trump administration mean for outsourcing QA? Not Convinced Yet About “Shift-Left Testing”?